Then how could you have missed these financial reports year after year? 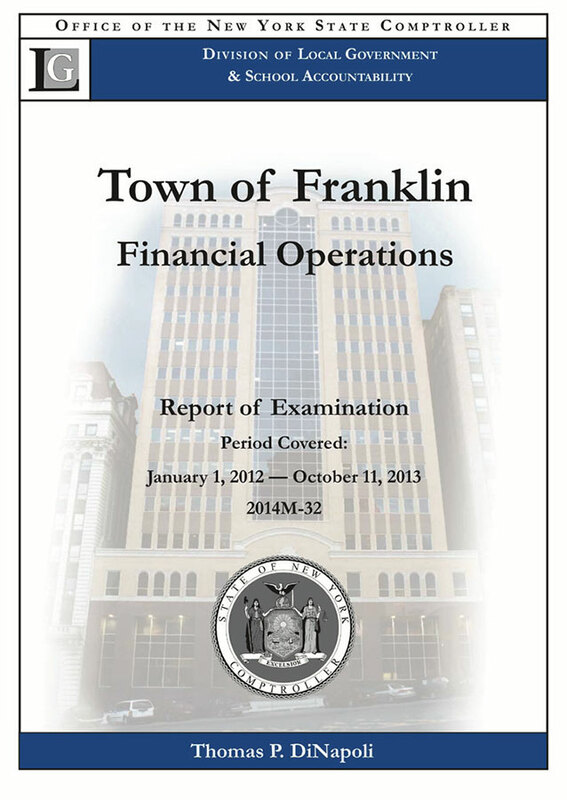 In 2013, an examination by the OSC of Town of Franklin Financial Operations found that our town has not been filing these required AUDs since the one for 2008. Even that one is available only from Albany. And how did you miss the report of this audit, Report 2014M-32? The report was in the Town Hall but until recently buried in the files and unavailable. The Town did publish the required notice in the back of the Walton Reporter in May 21, 2014. An annual report is a reasonable requirement. A town’s financial year should be book-ended by two documents. Before each year begins, a town is required to pass a budget, planning what services it will provide and how it will pay for them. After each year ends, a town is required to prepare a report on how that money was spent. For eight years in a row now, our government has not. The supervisor has the legal responsibility for the timely filing of this report. Supervisor Taggart was first appointed in 2012 and elected in 2013, but he has never fulfilled this responsibility. Supervisor Smith was responsible for the filings of years 2009, 2010, and 2011, which were his final years in office. Of the other eighteen towns in Delaware County, only one does not submit AUDs. In addition, Franklin regularly submitted AUDs until 2009. In response to the preliminary draft of this OSC audit, Supervisor Taggart acknowledged the findings and promised to “take measures to implement the suggestions made.” After the final draft was released in May 2014, Supervisor Taggart filed the required Corrective Action Plan (CAP) in which he outlined the actions to be taken by the town board for each of the recommendations. In this CAP, our supervisor states: “The Town Supervisor will file an annual report with the OSC and the Town Clerk, within ninety [sic] days after the close of the fiscal year, or 120 days after the close of the fiscal year if an exemption is granted.” He has not. In July when he filed his CAP, the financial report for 2013 was already three months past due. Like for the four years before it, the 2013 report was never filed. Our town government claimed to have begun work on the financial report for the next year, 2014, but the report was not completed by the deadline of March 2015. Last fall, in response to an inquiry, the Supervisor said that the financial report would be completed in December. As of March 2017, this report had yet to be filed with the town clerk or the OSC. Our government has yet to even start reports for the following years, 2015 and 2016, and thereby the supervisor remains in violation of the law and his own Corrective Action Plan. Concerning the submission of annual financial reports, NY General Municipal Law, Section 30(5) states: “It shall be the duty of the incumbent officer at the time such reports are required to be filed with the comptroller to file such report. The refusal or willful [sic] neglect of such officer to file a report as herein prescribed shall be a misdemeanor and subject the financial officer so refusing or neglecting to a penalty of five dollars per day for each day’s delay beyond the sixty days to be paid on demand of the comptroller.” Not filing timely reports after the OSC examination and the supervisor’s CAP is arguably “refusal or willful neglect.” Five dollars per day adds-up to roughly $1,800 per year for each report. In the case of Supervisor Taggart, this penalty could be applied for multiple years and for multiple reports. However, fines are at the discretion of Comptroller DiNapoli. This failure to file annual financial reports was not the only failure of fiscal oversight cited by the OSC. There are two others. Supervisor Taggart, the appointed financial officer of Franklin, was not supervising the deputy financial officer, Paul Warner, who does the actual bookkeeping. Taggart explained to the OSC that he was not familiar with basic bookkeeping practices. Every year, OSC staff hold several sessions of a two-and-a-half-day schools on basic accounting and one-day seminars. These are held in locations around the state including SUNY Oneonta. Webinars are available to learn from home. More importantly, as part of the system of checks and balances, the supervisor must annually submit his books and records to the town council within twenty days of their closing on December 31st – as must any officer or employee who receives or dispenses money. Then the four councilmen are required to audit these records within these twenty days. If the councilmen themselves cannot perform the audit, then they may hire an accountant. Required statements that are submitted must be entered into the minutes of the meeting for this annual accounting. According to the OSC, “Board oversight becomes particularly important in smaller operations which may not have an adequate system of controls because employees are required to perform duties that should optimally be segregated,” Fiscal Oversight Responsibilities of the Governing Boards (2014). This Local Government Management Guide is available on the Franklin Local website, as are others. The OSC had to extend its review of financial operations for 2012 back to 2008 to find the last annual financial report, but could not find a single audit during that time. Going back further, the town clerk knows of no audits in the files. Because town audits do not have to be filed with the OSC, we do not know when the town books were last audited by the council. Our supervisor has not managed to produce a single annual financial report. Our councilmen have not managed a single annual audit. This despite the exposure of these failing by the Office of the State Comptroller and the subsequent commitment to follow the law by our town board. Citizens of the Town of Franklin have the expectation that – at the very least – its government would do the legally required minimum to safeguard their tax dollars.